ROBERSONVILLE, NC – You couldn’t ask for a much better evening to go racing than Friday night, the forecast called for 80 degrees with a few clouds here and there, something we haven’t seen in months. Friday night played host to race number two in our little 10 race special feature. 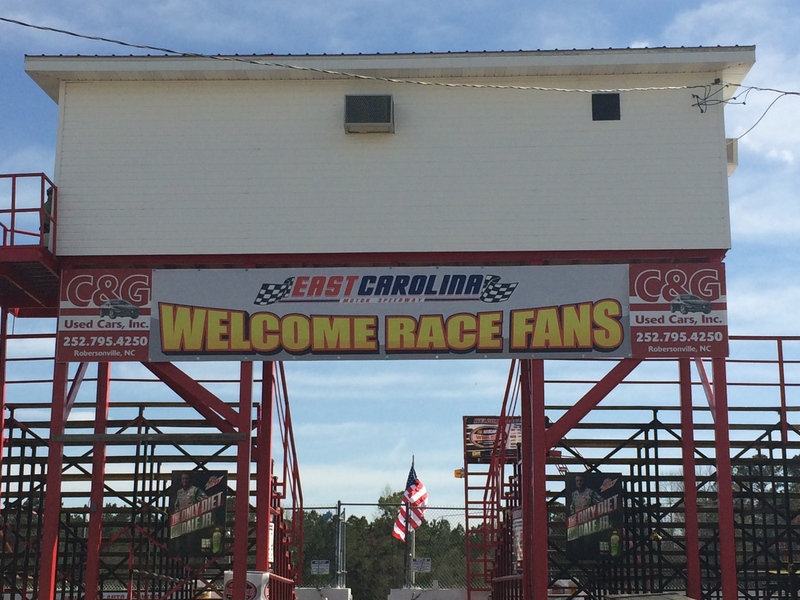 East Carolina Motor Speedway in its inaugural season under NASCAR is on the constant rise and looking for more cars to take the track. Like most tracks, East Carolina’s premier division are the Late Model Stock Cars, and with only seven cars on both nights fans have yet see the full potential this facility has to offer! Leading up to Friday’s event track management told me they have been working hard on getting sponsorships sold and working with local media outlets to make the speedway North Carolina’s premier short track for Friday night racing! Even talking with drivers from my local area about East Carolina Motor Speedway like past Langley Speedway champion Mark Wertz, “It’s a great track,” Wertz tells me. “I ran there back in the 90’s some. I plan on bringing our banked track car that way a couple times when things get settled down.” Eventual Langley Speedway opener Greg Edwards had nice things to say about the speedway, he did not confirm nor deny a possible trip with a Late Model in the future. This week I decided to spend practice down in the pits watching teams get their machines ready for the evening. I will say one thing I was glad to see is the overall car count was up! Had a few more UCAR’s this weekend who later put on a pretty good show! The #48 of Duane Walker, who has won plenty of races in the past started dead last via the draw and climbed to the 3rd position in just one lap! Walker did take the lead on lap 12 and put a good five cars between him and Brandner only to fall way off the pace in a few laps to hand the lead back over to Brandner. Thomas Brandner and the #24 car would hold onto the lead and captures back-to-back victories! Mini stocks were next on the track and by the luck of the draw previous winner Kevin Pierce started on the outside pole. 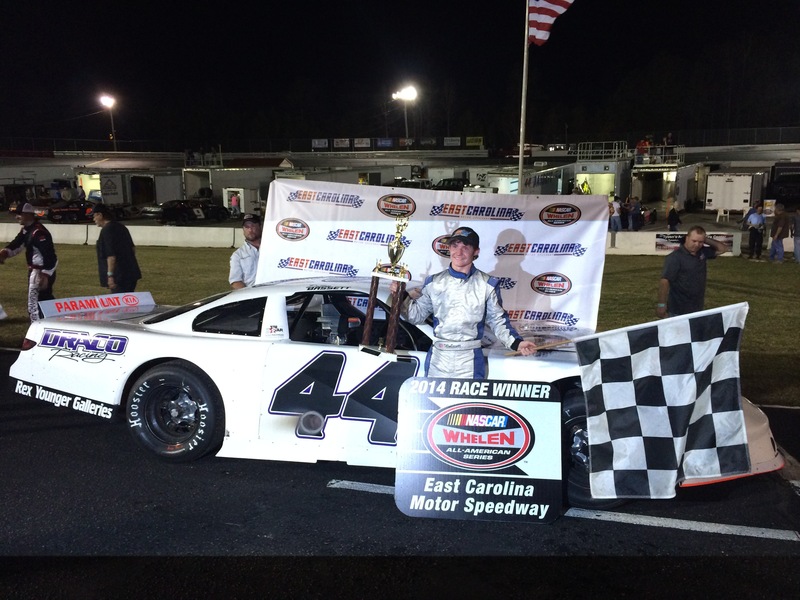 Pierce did not stay there long as he took the lead and dominated yet again as he too took back-to-back victories at the high bank tri-oval of East Carolina Motor Speedway. With a little bit of a schedule change from opening night, the Limited Late Models were moved to race number three and boy did they put on what I think was the best race of then evening. From the drop the green flag the top three cars battled from lap one to lap 50 in a caution free race! Only took twelve laps in for Louis White and the number 7 machine to battle for the lead. White’s car looked to be able to gain on the #99 of Taylor Howard in the corners but would fall back just a bit on the straightaways. For most of the race your top three of White, Daniels and Howard could be covered by a single car cover! On lap 31 of 50 we saw another new leader, the number 16 car of Rusty Daniels and let me tell you Louis White did not make it easy for Daniels. White worked on on the 16 car putting the bumper to him a few times, not a gigantic hit but just enough to make Daniels have to get on the wheel, who eventually took the lead back on lap 42. Daniels would come back and give White a taste of his own medicine taking the lead back with 4 laps to go with the bump and run but was not enough to hold off Louis White as he takes the checkered flag and earns his first win of the season. Your second place car the 16 of Rusty Daniels followed by your pole sitter Taylor Howard who seemed to just fall off the pace with just about five laps to go. Your fourth place victor on the night was the 12 machine of Wesley Johnson. Johnson started outside of the top five with the sixth best time of 16.050 and had an amazing run into the top five. Rounding out your top five was the 77 car of Garrett Marchant, who is currently looking for a few more sponsors to help with this season. Marchant who qualified third with a 15.978 was able to hold on to his first top five of the season. 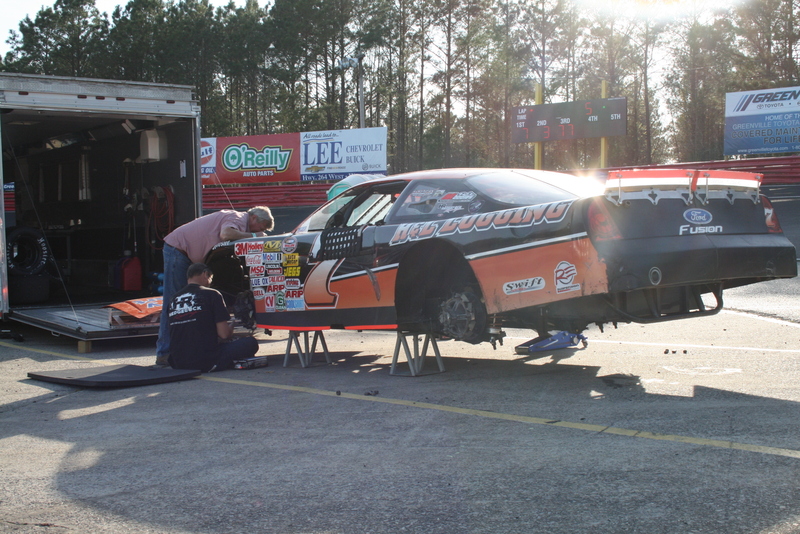 The Late Model Stock’s were back in town again this week for race number two on East Carolina Motor Speedway’s second race of the year. 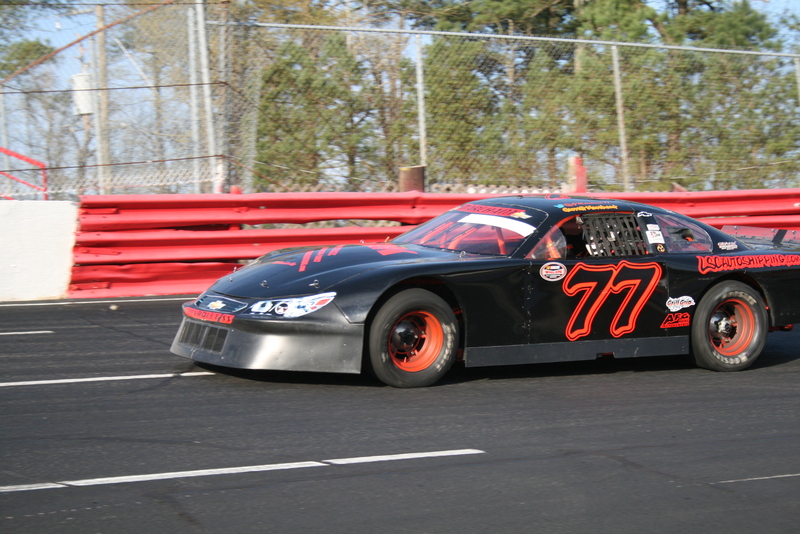 For the second week in a row only seven LMSC showed up for the 100 lap feature event. We had all but one driver return for race two while a new driver came into town. 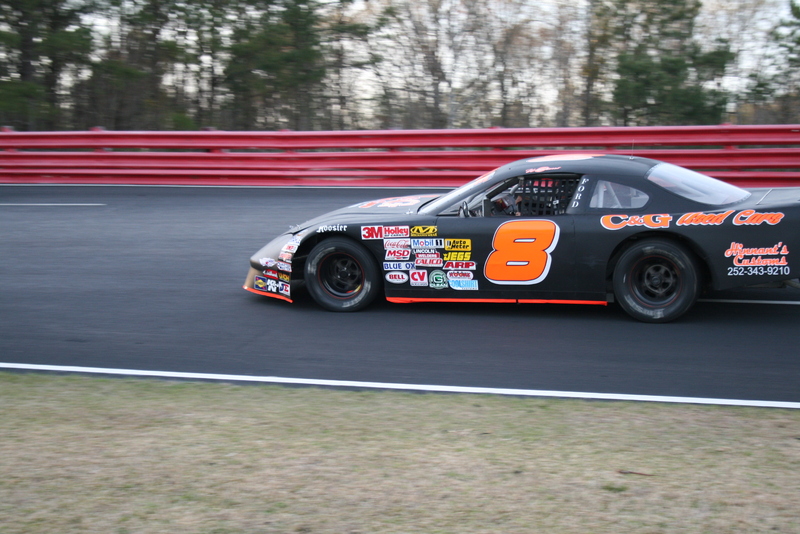 Opening night winner Deac McCaskill (2014 SNMP Champion) set a blistering pace earlier in the evening setting on the pole at 15.292, the 9 of Thomas Burbage starting outside row one. 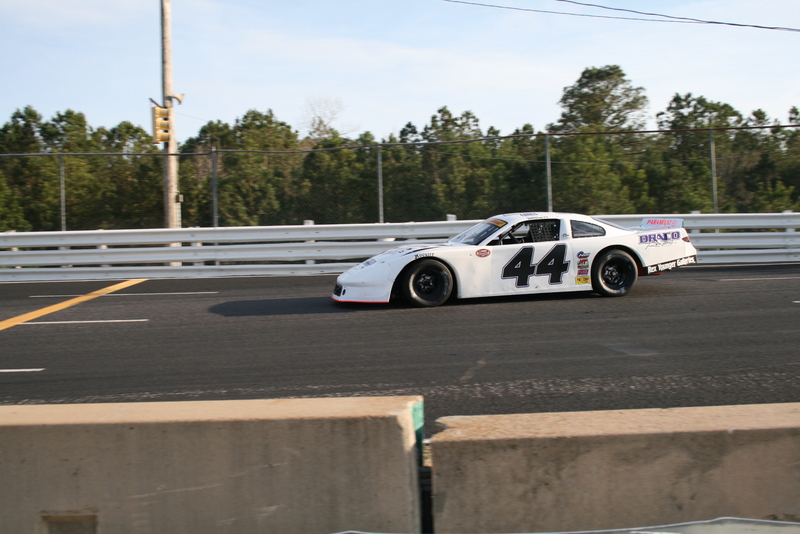 Newcomer Dillon Bassett, brother to SNMP All-Star Classic winner Ronnie Bassett Jr, started inside of row two with Shelton McNair starting to his outside. Josh VanWinkle in the other 44 started the evening inside of row 3 with the 01 of Jeff Shifflett to his outside in P6 and Brian Whitehurst rounding out the field in the black number 8. Thomas Burbage and the 9 car had a great run on the restart of lap 50 pulling up to the door of McCaskill but the 08 just had the stronger car as he was able to keep second position. Things were looking good for Burbage up till lap 69 when the car dropped a ton of fluid down the back stretch, his car and his night came to a rest on the apron of turn 3. Dillon with almost a hiccup as he is slow on the restart of lap 70, McCaskill tried to muscle past him but just not enough car as Bassett jumped out to a two second lead with 25 laps to go and as the field spread out no chance for another caution as Dillon Bassett held on to take the victory. “Its really cool you know, being the first time I ever seen the place,” Bassett explains. “Early this morning we came down here and tested, felt like we struggled a little bit but worked on it when we were able to come in and practice. Its really unique to come to a place like this and be able to win your first time its just really neat.” Besides only limited track time Dillon also told me how he likes to drive into the corners really deep and that was something he could not do here at East Carolina. “I knew we had a really good car once we got strung out,” Bassett speaking about how good McCaskill was on restarts. “Just trying to be cautious on the starts, didn’t want to over drive it and wash up into someone and wreck, just trying to be easy on the starts and let everything settle itself out.” Well he had that strategy down to a science as it only took the 44 car about a half way through turn one to come back up to full speed. 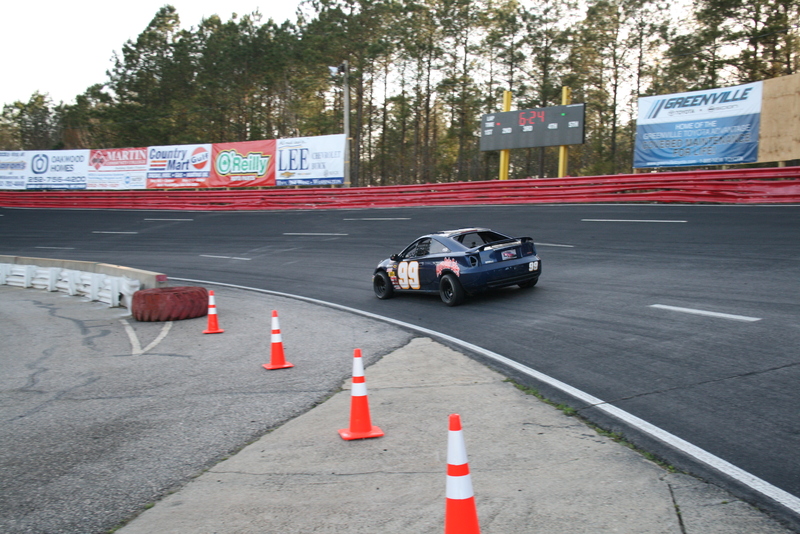 Earlier in the day I was floating around the mystical place of social media and saw Dillon was out at SoBo doing some testing, I mentioned it to Dillon sort of off the record wondering if he was going to run the Twin 75’s they had the following day, he informed me he would more than likely go out to Caraway Speedway and run because SoBo only allowed the 390 on the Ford crate motor. So Bassett and his crew loading the 44 machine back into its stable, strapped the winning trophy down in the truck and headed 200 miles west to Caraway Speedway where Bassett took home another victory going 2 for 2 on the weekend. 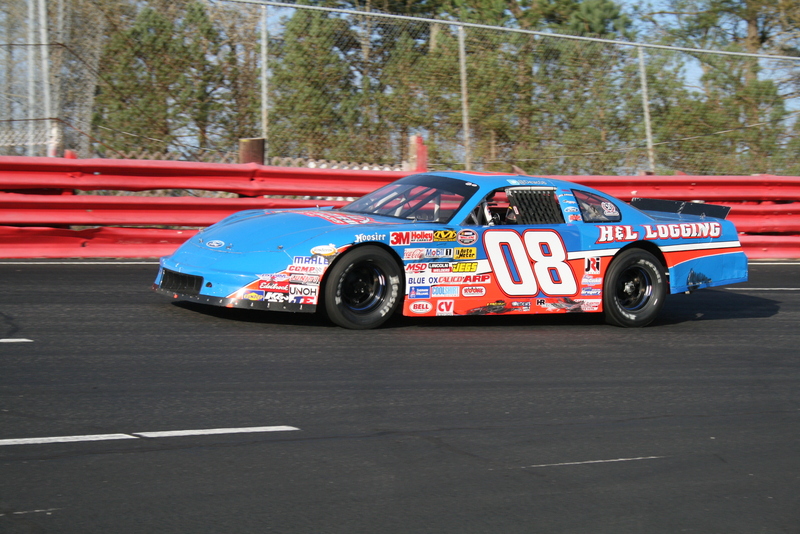 Bassett also told me to look for him this year at most of the big races as he and the team looks there to focus most of their time and energy, he also did not rule out the Hampton Heat 200 at Langley Speedway. As the evening started to come to a close I was happy to be able to network with some of the drivers down on pit road, get our name out there and hopefully bring some new drivers to the site. East Carolina Speedway kicked off what is surely to be more double header weekends of racing and this is why it landed its self as race #9 on our top 10 races of the 2014 season. With the help of you the fans I think East Carolina can play host to not only a spoiler in the national points but for the North Carolina state title. If you haven’t already please visit the track on the web at www.ecspeedway.com, you can also follow them on social media outlets like Facebook & Twitter for all kind of updates throughout the season. Of course we here at The Weekly Racer will do everything we can to keep you guys up to date with the most recent news for all the pertains to East Carolina Motor Speedway. Good article! Only one problem. You left out the best race of the night. Street stocks. I will take this all into account on the 18th. I spent most of the that race in the pits. I am glad you guys are reading, thank you for your input! I would love to feature you guys in our Driver Series as well!